It’s harvest time, so reap the rewards of the fruits of your labour! The mature trees should be laden with fruit so go prepared with bags and hungry friends. 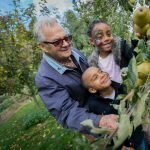 Apple Day Celebrations are held UK-wide around October 21st and celebrate the local distinctiveness of places and their traditional fruit varieties and customs. It’s a great chance to try new varieties, talk to experienced growers, and eat lots and lots of apple pie!